Danny's drink is spiked at a party. 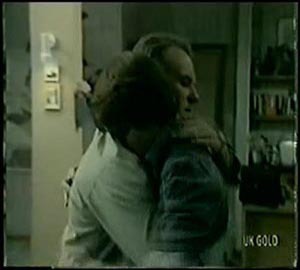 Jim gets a call that Danny is in hospital. Maria, Shane, Jim and Scott are at the hospital. Maria is crying. Scott blames himself for not stopping the party sooner. Max rushes in, still dressed in his plumbing clothes. Max is appalled and starts ranting at Maria for not controlling Danny. Jim makes them stop shouting. MARIA: He's just a boy. I'm so scared. Max apologises to Maria for blowing his top and starts to comfort Maria instead. Jim and Scott head off home. The doctors are tending to Danny, saying hopefully the worst is over. Max is telling Maria that Danny is a good kid and he's never really given him a fair go. He's sorry for not trying to understand Danny. SHANE: It's not too late, you know, Dad. MAX: I hope you're right, Shane. Max says he'll try to be a proper Dad to Danny - come round and see him more often and talk to him. The doctor comes back. He tells them that they've pumped Danny's stomahc and they think he'll be alright. Jim sits Scott down for a talk. He wants an explanation for what happened that evening. Scott says it's his fault - he didn't stop the party. 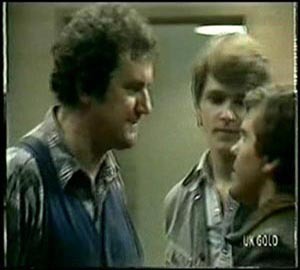 He tells Jim there were drugs at the party and the dodgy guys must have spiked Danny's drink. Jim asks Scott why he didn't ring the police, but he says Danny was enjoying the party. Scott didn't want to dob in his best mate. Jim says that Scott made an error of judgment. Scott is upset - Danny might die because of him. Jim gives him a hug. Jim has made Scott a cup of tea. Just then there's a knock at the door. It's Max, come to tell them that Danny is going to be OK. Max is still worried about any side-effects though. Max wants to talk to Scott - he wants the name of the mongrel who did this to Danny. Scott is reluctant to tell him, but Jim says there is loyalty and stupidity. Jim says that Danny could have died and in the future some other kid might not be so lucky. Danny starts to come round. Maria is there and explains that he's in hospital. His stomach is hurting and Maria explains that his stomach has been pumped. Danny starts to remember about the party and asks how Scott is. He says he doesn't remember what happened - he was at the party and everything was a mess. He drank some Coke and then - nothing. He says he wouldn't take drugs - someone must have given it to him. They leaves Danny to rest. Danny says that he's sorry - he didn't mean to lie to her, he just got hooked on the party idea. 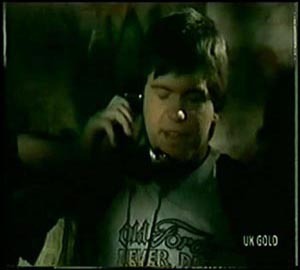 Scott is ringing the dodgy guy, Pete, who gave Danny the drugs. Max is impressed at Scott's guts. Scott tells the guy a story, that they liked the drugs. He offers him a deal - he knows someone who's interested in buying some drugs. And willing to pay $500. He says he'll get a package together for later this morning. Max takes the phone and says he's going Interstate, and he wants the drugs in half an hour. They agree to meet. Max puts the phone down. The Party hall is in darkness and Scott is standing there in the dark. Pete comes in and Max says he's the buyer. He wants to see the stuff. 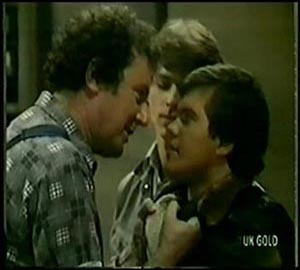 Pete gives it to him, but then gets a bit suspicious and suddenly recognises Max as Danny's father. Scott tells him that Danny is in hospital. Max says maybe it's about time Pete was there too. Pete tries to get away but Jim blocks the exit. Shane and Maria comes in from the hospital. Maria is blaming herself for going to the lecture instead of supervising Danny's party. Shane tells her not to be silly. He says it's more his fault for not being there - he's seen parties like that before and they get out of hand. Maria says it's hard to see Danny growing up so much. Shane says maybe Danny won't be in so much of a hurry after tonight. Shane says that maybe he's been trying to go too fast too. Max has got Pete by the lapels. PETE: Let me go, you can't prove anything! MAX: We got the stuff haven't we? First I'm going to punch your head in! PETE: It was just a bit of fun. MAX: FUN?!! Pushing drugs to kids, putting my son in hospital, you call that fun?!! PETE: No, please, stop it, I'll never deal again, honest! Max tels him he's pathetic and he'll put him out of business. 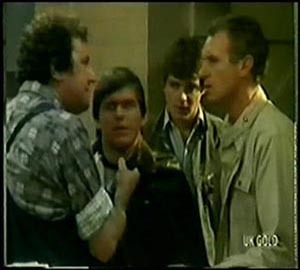 Jim says tries to calm Max down and says he's going to get the police. PETE: I'll get you for this, Scott Robinson! The police have rung for more details about last night. They want to talk to everyone who was at the party. Scott says that Danny will be in a difficult position, but Jim says his real friends will stay with him. Maria and Shane have brought Danny home. Maria fusses over him and Danny says he doesn't deserve it. Danny says he has a couple of things to say to them. First that he's very sorry for lying to Maria about the party, and Scott tried to talk him out of it but he didn't listen. He would never do it again - he's learnt a lot from last night. Mainly that some people you think are your mates aren't, and sometimes the things you want you shouldn't have. He says he was a stupid kid who thought he knew everything. Now he's going next door - he's learnt that a good mate sticks by you no matter what. Maria says she's preparing a special dinner now - it is still Danny's birthday. Danny apologises to Jim for all the trouble he's caused him. Jim says that his parents are going through a rough time at the moment. He tells Danny to support them from now on, instead of making trouble. Shane is just going out to mow the lawn. He says it's too late to go on his trip now. But he's going to stick around now - now that Max isn't there. Maria thanks him - she needs Shane's help with Danny. 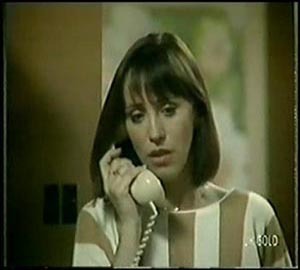 The phone rings and Maria answers. It's Mr Freeman from the party hall. He wants $500 to pay for the damages.